This year I ordered a fully cooked turkey from Whole Foods, and so far, I feel pretty good about it. It’s nice being able to focus on just the “fun” things like sides and desserts. Hopefully there won’t be any regrets when it’s time to bring out the bird, but somehow I doubt it. Skipping the turkey choosing/buying/roasting process has made everything else seem like a walk in the park! I even had time to test an extra recipe, which I’m hoping will come in handy for someone who wants a scratch apple dessert, but doesn’t feel like dealing with traditional pie crust. This is a crumb topped apple dessert you can throw together in minutes (depending on how good you are at peeling apples). It’s from An Amish Kitchen by Beth Wiseman, Amy Clipston, and Kelly Long. And it looks like a fun cookbook for anyone interested in Amish culture and traditions. Since I made this as a test rather than for the full meal, I made a quarter batch and baked it in a small pie dish. The filling was smooth and cinnamon-y and the granny apples added a little tartness. You get a big payoff for very little work, so I’d say this recipe is a keeper. Now I need to order the book so I can find out who Rosemary is. 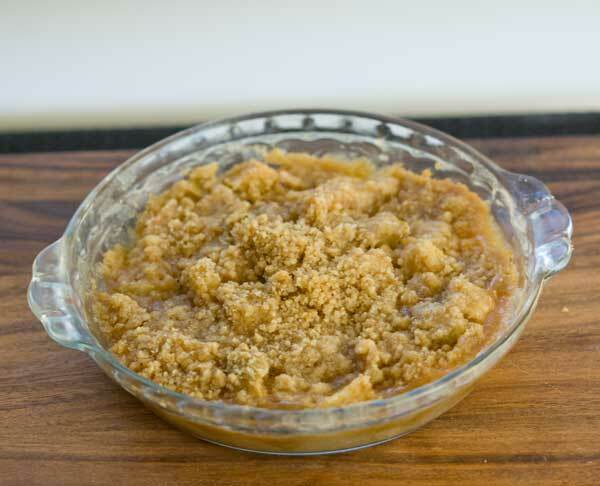 An easy apple crumb recipe baked in a pie dish. Thanks for the report, Judy! I agree. The cream makes it special. I need to make it again with a crust. I made this today and used my own pie crust recipe. The apple filling was out of this world! It is sure a keeper. Amy, I skipped the crust completely so mine is more like a crumble. However, you can use whatever brand crust you like. The Pillsbury refrigerated roll-out crust is always good, but if you want even less work, look for Marie Callender’s or Pillsbury frozen crusts. Hmm – I love apple crumble but don’t usually add in a pastry case. Think I’ll have a go at this one. Anna— if I don’t want to make the crust should I use the crusts you roll out (that come in the box) or those frozen pie shells? I’m not an expert at pie making obviously but I think I could handle this recipe. Don’t let yourself slip into regret over not buying/preparing./cooking the turkey. We so often do what we think others expect, rather than what we really want to do. The last couple of turkeys I’ve bought are the pre-stuffed, cooked from frozen turkeys…. and you know, I’m so much less stressed and get to focus on the parts of the meal I really enjoy getting ready. Oh, but I think I will add pecans to the crumb topping. Pecans make EVERYTHING better. Since I have a slight fear of pie crust and love crumb topping more, I’ll definitely make this, most likely for Thanksgiving. I hadn’t yet addressed the (lack of) pie situation. Oh, and this year we bought a smoked turkey. I’m also enjoying not worrying about cooking the turkey. My one dilemma was gravy. I don’t like prepared gravy, so I decided to go with milk gravy, as I also have a few vegetarians attending. I’m hoping that pleases everyone.